Balboa Ozone Generator with Valve and Pipe. This Ozone activates, usually during a pre-programmed filter cycle, some Hot Tubs have a 24hr circulation and Ozone mode. We recommend that your Ozone should run for between 6 and 8 hours a day. The unit does not blow air, air is drawn through the Ozone on a venturi system. Usually you will find a designated water jet plumbed in to the shell of the Hot Tub somewhere near the centre or sometimes a drain. Water will pass through the jet sucking in air through the Ozone injector which will be connected to the Ozone. During a filter cycle the Ozone unit will be powered up, the Corona Discharge mechanism will kick in and charge the oxygen with Ozone which enters the tub and in turn helps to kill bacteria with the aid of the sanitisers in the water. 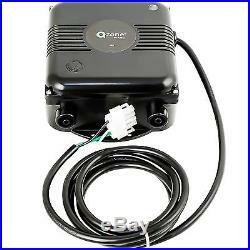 This unit can be fitted to virtually any Hot Tub with a venturi system. This unit replaces the older style UV cylinder style unit. Can be used with Spaform, Aegean, Leisurerite, Leisure Bay, Hotspring, Sundance, Marquis, Master Spa, Signature, Southwest Spas, Hydrospa, Hydropool, QCA, Sunset, Sunrise, Sunbelt, Beechcoomber, LA Spas, Dimension 1, Saratoga, Emerald Spa, Sapphire Spas and more.. Usually screws to an upright up as high as it can go. We advise that there should be a double air loop with a one way valve (included) to stop water passing back through. The Ozone pipe is clear and can usually insert into a 3/8 inch air pipe connected to your venturi system, this will push fit on to the Ozone unit. The ozone comes with a 3-wire, 4-pin AMP cord but can easily be swapped over with your original cable or by the adapter in related items below if needed. 900 + 250 heater. Life span is generally 2-3 years depending on use. Please note: Most hot tubs were fitted with the Del ozone but these are no longer available. 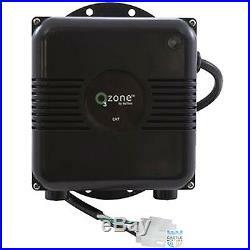 If you got the Del Ozone in your spa please keep the old cable and replace it. We at Castlehottubs recommend that this should be done by a qualified Electrician or Hot tub engineer. Please Note: All electrical spare parts MUST be fitted by a qualified electrician or Hot tub Engineer. Castle Hot Tubs is a well established, trusted name in the water care industry, we will do our very best to ensure that your purchasing experience with us is a pleasant one. Goods ordered before 1pm will be sent out on the same day. The item “Balboa Ozone Generator Master Aegean SpaForm Gulf Spas Ozonator Hot Tub compleat” is in sale since Monday, May 14, 2012. This item is in the category “Garden & Patio\Swimming Pools & Hot Tubs\Hot Tubs”. The seller is “castlehottubs” and is located in haverfordwest, Pembrokeshire. This item can be shipped to United Kingdom, Austria, Belgium, Bulgaria, Croatia, Cyprus, Czech republic, Denmark, Estonia, Finland, France, Germany, Greece, Hungary, Ireland, Latvia, Lithuania, Luxembourg, Malta, Netherlands, Poland, Portugal, Romania, Slovakia, Slovenia, Spain, Sweden, Norway, Switzerland, Australia, United States, Russian federation, Canada, Japan, China, Israel, Hong Kong, Indonesia, Malaysia, Mexico, Singapore, South Korea, Taiwan, Thailand, Chile.